Consult Product Supplier - Consult product supplier for guidance and COSHH data information. 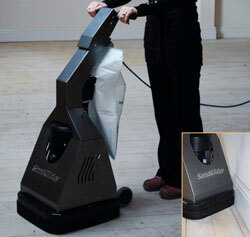 The Sand Glider is a new alternative to the traditional light duty floor refinishing sander. Designed for the light sanding, polishing and refinishing of floors it is simple to use, and provides a low dust alternative to traditional floor sanding methods. Featuring easy to attach velcro sanding or polishing pads and with its random orbital technology the Sand Glider makes sanding and polishing effortless and stress free. Ideal for applications like re-finishing floors and creating a 'smooth finish' on traditional parquet, laminated, veneered and solid wood floors. The Sand Glider is ideal for use on lighter duty jobs where the floor surface has not been subject to heavy foot traffic or regular wear and tear, leading to an uneven surface. For heavier duty jobs involving more worn, heavily stained, or uneven floor surfaces the traditional Floor Sander (05412), Edge Sander (05422) or combined hire pack (05429) should be considered. Click on the video below to see the Sand Glider in action.